Queer Eye is coming back for more! Netflix just announced they’ve renewed the TV show for a third season. A remake of the successful Bravo series, the reality show features five gay experts as they help a straight man makeover his life, focusing on wardrobe, food, lifestyle, interior decoration, and hair. The fab five includes Antoni Porowski (Food & Wine), Bobby Berk (Interior Design), Karamo Brown (Culture), Jonathan Van Ness (Grooming), and Tan France (Fashion). Today Netflix announced the season three pick-up and start of production for the Emmy(R) Award-nominated Queer Eye. · The eight-episode third season begins production in Kansas City, MO on July 16, with co-hosts Antoni Porowski (Food & Wine), Bobby Berk (Interior Design), Karamo Brown (Culture), Jonathan Van Ness (Grooming) and Tan France (Fashion). · The make-better series recently received four Emmy(R) Award nominations for its inaugural return season with recognition in the Structured Reality Program, Casting, Picture Editing and Cinematography categories. 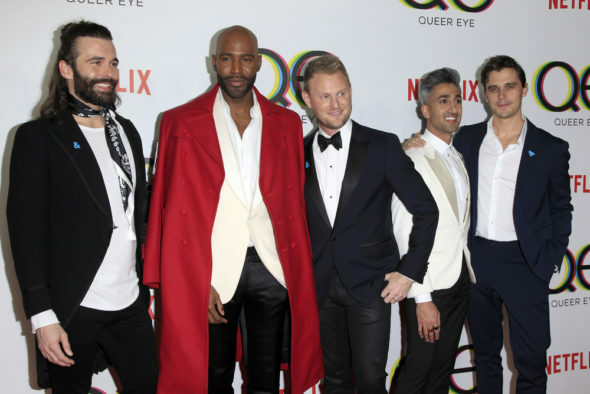 · Queer Eye season three will debut in 2019. · It’s been fifteen years since the Emmy Award-winning series Queer Eye for the Straight Guy revolutionized reality television. The series returned to Netflix in 2018 going global and introducing audiences around the world to a modern aesthetic, diverse perspectives and a brand new Fab Five. Netflix’s new Fab Five are forging relationships with men and women from a wide array of backgrounds and beliefs often contrary to their own, touching on everything from self-love and faith, to immigration and how to make the perfect homemade poke bowls and more! What do you think? Are you a fan of Queer Eye? Will you watch season three? YES! Such a fun show!